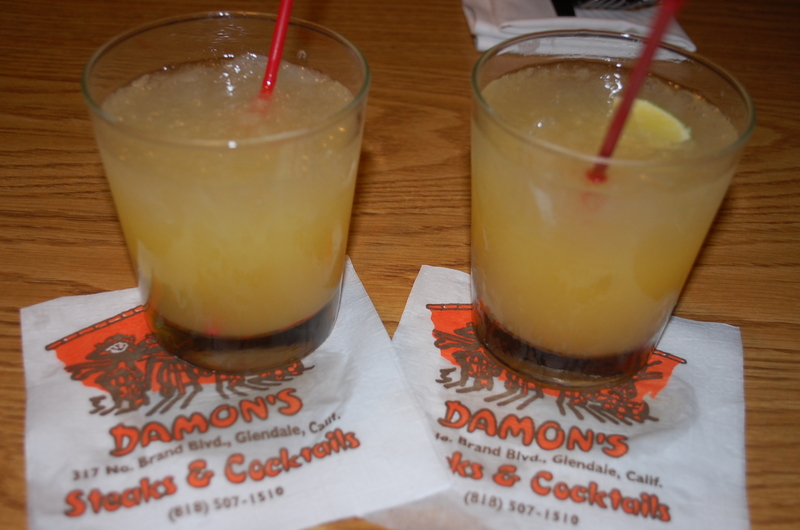 Without knowing it was a special event, we walked into a 73rd birthday celebration at Damon’s in Glendale last night. We had tickets to the Glendale Center Theater and thought we would have a light dinner at Damon’s. Balloons decorated the entryway and throughout the restaurant and tables. Two huge birthday cakes (by nearby Porto’s) were prominently displayed for guests to see and taste later in the evening. As we sat down, we were given two raffle tickets to win prizes: bottle of rum, Damon T-Shirts, and $50 gift cards. We started our evening with two $6 Mai Tais. As we looked around the restaurant, we noticed everyone had a Mai Tai on their table. The kitsch style Polynesian décor brought a smile and giggle. The old style Hawaiian theme looks like a low-end Trader Vic’s. The booths are lumpy and the tables are worn, but as one sips a Mai Tai and listens to the Hawaiian music playing in the background, the fun begins. Many of the waitresses have been here for over twenty years. They are sweet and efficient. When the busboys brought a Roast suckling pig around to every table on a tray with garnish, I felt I was at a Hawaiian Laua in Honolulu. The food is just average, but the service and atmosphere make dining a special experience. We started with a house salad. It’s served in a large salad bowl and tossed by your waitress. The creamy French vinaigrette looks just like Catalina salad dressing. Unfortunately, our salad was swimming in the dressing. Rick ordered the Grilled Mahi Mahi served with a Hawaiian Pineapple salsa. Though the fish portion was generous, the fish was a little dry and the pineapple salsa standard fare. Both of us ordered their famous twice baked potatoes. Again, a little too dry for my taste. They tasted as if they were made earlier in the day and left sitting in a warming drawer for hours. For dessert we had the too sweet coconut carrot cake and a piece of Porto’s birthday cake. A drawing was announced and I won a Damon’s t-shirt. The manager arrived at our table congratulated me and thanked us for coming to the birthday party. By the time we left, the place was packed with happy people sipping Mai Tais and having a great time. Don’t expect gourmet food, go to have a great time in a fun atmosphere. filled with friendly regulars.